You likely know a few of the bigger named acts on the bill. Like Bowling Green, Kentucky’s own Cage The Elephant or Breathitt County’s Sturgill Simpson. You have likely listened to artists like LCD Soundsystem, Weezer, PJ Harvey and NEEDTOBREATHE for years. But with any Festival, it’s worth your time and efforts to catch the earlier, lesser known acts. Why? I’m glad you asked. See, music is a journey. A long-winding road (pun fully intended) that more often than not, passes through many smaller summer festival stages, building fanbases along the way to eventually leading artists to that main stage. 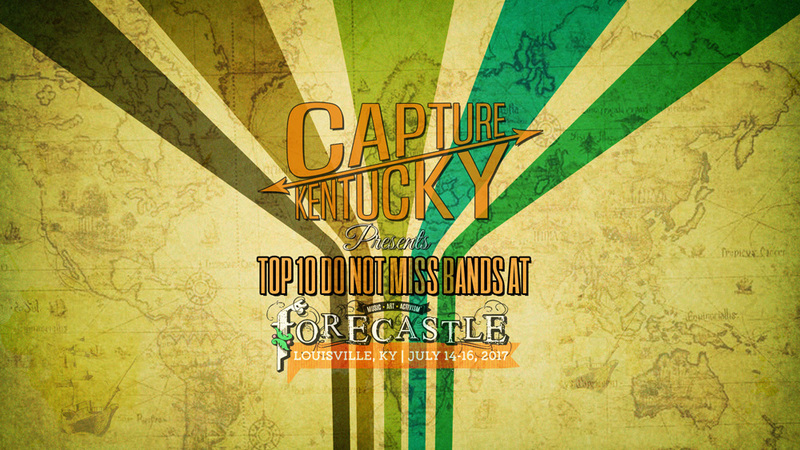 So for this weekend at Forecastle, we decided to put together a top 10 list of artists that we feel have the potential to be headliners someday. Artists on the rise that deserve your attention. I mean, you wanna someday be able to say to a friend, “I saw them on this tiny stage at Forecastle. I can’t believe there were only about a hundred of us there.” Well, here’s who we feel have the potential to help you in that quest. 10. Thankfully I had the pleasure of catching part of a set from Louisville natives Quiet Hollers earlier this year at Moonshiner’s Ball. I was rather taken aback by their performance and they’ve been on my radar ever since. I described them then as being in a Bruce Springsteen lane with a fiddle instead of a sax. With the release of their new album, “Amen Breaks”, the story-telling aspect is still strong wuth a hint of Pink Floyd and the band is ready to make their mark on Forecastle. Check out a new track called “Broken Guitar” below. 9. The Port stage hosts Teddy Abrams and Friends from 9-10:30 on Friday. Teddy is the youngest music director in the history of the Louisville Orchestra. He will host several musicians and present a very uniquely Louisville experience. Check out his Mohammed Ali tribute he did in collaboration with Louisville native Jim James of My Morning Jacket. 8. COIN are next up on our list. Quite a few of ya will already know this band from their hit “Talk Too Much”, and that has earned them a spot on the Mast Stage, albeit a very early spot at 1:45 on Sunday. Their future is a bright one, so be sure and get there early. 7. The Port Stage is where it’s at on Sunday at 8:15. Rayland Baxter brings his smooth voice and heart felt personal songs will be a great way to calm down and catch your breath before Weezer brings down the Mast Stage at 9:15. I was asked who Rayland reminds me of, and if I had to make a comparison, it’d be a country-leaning, blues-influenced James Taylor. Mainly because of the smooth vocals and the very personal take. Here is an example for ya. 6. Mandolin Orange play the Port Stage at 6pm on Saturday. I strongly suggest that you catch their set. At least give them a listen before heading over to catch Judah & The Lion or Cashmere Cat. I promise you their level of musicianship will completely mesmerize you. See if you don’t agree after watching this performance of “Wildfire”. 5. I was really hesitant to put any artist on this list that’s already playing the Mast Stage, especially a second one, but Charles Bradley & His Extraordinaires are that important. If you see one act this weekend, see Charles Bradley. He wasn’t discovered until later on in his life and plays a style of music that is the very foundation that so many artists build upon today. He spent years as a James Brown impersonator, he has a voice like Otis Redding and he’s still with us. Go. See. Charles Bradley. 4. Joseph takes to the Boom Stage on Saturday from 3:15-4pm. This talented trio of young ladies have harmonies for days. These sibling voices weave and intertwine forming an alluring band of sirens that will hauntingly draw you ashore. Check out their recent performance on NBC’s Today Show to see what I mean. 2. K. Flay takes the Ocean Stage at 4:45 on Saturday. Outside of Run The Jewels, she is the artist that I haven’t seen, that I am personally most anxious for. I truly believe that this is the beginning of a journey that will propel K. Flay into international superstardom. She has an old school rock’n’roll attitude while mixing many genres to create such a unique sound. Here, see for yourself in this NSFW video. 1. Foxygen deserves your full attention at the Boom Stage on Sunday at 4:15. This band my not be a household name yet, but their style, sound, presence, harmonies and uniqueness will change that very soon in my humble opinion. For me, this band stands completely seperate than any other band on the bill. They sound like no one, yet they’re unforgettable. In a town that loves My Morning Jacket and Cage The Elephant so much, Louisville is going to absolutely fall in love with Foxygen.